You should be seeing above here my Ebook titled "Farm Animals What Do You See?" If it has disappeared, once again, then please click on the following link to be taken to see it full screen http://bit.ly/LJIgWP . “Picturebook: School Edition” is an Ebook creator app that can be purchased through iTunes. Students in the early primary grades, would enjoy creating with this. My story with its rhyming pattern is fashioned after the book,” Brown Bear, Brown Bear What Do you See” written by Bill Martin Jr. and Eric Carle. In “Picturebook: School Edition” you can choose pictures from 13 different categories or use your own photos, as well you have 6 different design covers to choose from. When looking to choose a title one has to be watchful of the title length. I originally called the book "Farm Animals, Farm Animals What Do You See?" but in read mode part of the title was cut off, hence a shorter version. When writing the story itself, you can write text on the first page and then copy it page to page or add new text to each page. I found it took me much longer to create the book than I expected. A good reminder that one needs to use a tool as one sees their students using it, so they have a true sense of the experience. This app has a number of possibilities for young primary students. An idea I had is in relation to the buddy system, older students working with early primary students, the younger students could choose the pictures and then together th students come up with the text for each page, with the older typing the text. Tracy Cameron, the leader of the cohort led seminar on Ebooks/ETextbooks for which I created this book, suggested, “This would be a great way to introduce students to the creation of eBooks, by having them re-create a story before creating their own! This way they could focus more on the creation and the aspects they want to include instead of focusing on the story. Then their second eBook could focus on a story they have created and they will have had experience already with the creative side of an eBook. “. One thing I wondered, as I was creating this story on my iPad, if children are exposed to tablet and smartphone use from a young age will creating stories with this app, which is at a basic level, be something they will have been involved in for a few year and as such will they then be looking for more advanced opportunities for creating Ebooks, or will this once again depend on each students pre-school experiences and thus affect the level of technology skill that students come to school with. If so could this variance in skill level, among students in class, be a barrier to what technology you look to integrate into your classroom? In looking to our critical challenge question, “How might we deal with this barrier?. Best pedagogy sees teachers assessing students’ skill levels and developing ones curriculum based on this. We take students from where they are and move forth. What Ebook creator one student uses may be very different from what another student uses. Once again we need to look at meeting each student's individual learning needs. Picturebook: School Edition includes over 250 illustrations in 12 complete picture sets and all available add-on features. Plus: No ads and no in-app purchases. Choose from a constantly updating library of cute pictures. Narrate your story with any text you like. Add your own photos. Share your picture book with friends and relatives. Curl up and read your very own bedtime story. +Compatibility: Requires iOS 5.1 or later. Compatible with iPhone, iPad, and iPod touch. This app is optimized for iPhone 5. At the school I teach at students have always been allowed to bring their own device. WiFi was in place, but we had to wait for what seemed quite sometime, to get the okay to allow students to access it. Students had access to desktop work stations in each of our five shared classrooms and the student lounge. But, for adult students in particular, it was frustrating that they could not access WiFi on their own devices, especially those who were Mac users. Part of the reasoning around no access was related to bandwidth and setting up district wide access protocol. I have seen over the years more and more students bringing their own devices, whether this is a laptop, smartphone and more recently tablets. At the middle school level, where students attend for tutorials up to three days a week, students are welcome to BYOD if they are using them as an aid to their learning. The expectation is laid from the start and if the device becomes a distraction issue they are asked to put it away or give it to the teacher to hold on to. I have found this year that the ones who are most often asking to bring their own laptops are those who deal with anxiety. The comfort of using their own computer reduces their school related anxiety. 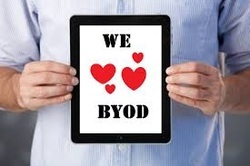 The blended BYOD program sounds like a good idea, those students who have the devices and wish to bring them to school do and all others have access to ones at school. I have one concern. I can see that some schools will have a large number of students who can bring their own device and thus not have to purchase many, whereas other schools may have few that can BYOD and thus have to look at purchasing many, which might not be feasible. It once again comes back to, how do we make sure that all students have equal and equitable access? How do we work to reduce the digital divide? The lack of access to devices relates to one area of our critical challenge question, “What are the barriers you might face in implementing a technology integration”. One cannot look at implementing a technology integration if the school they work at does not have the technology available for students. 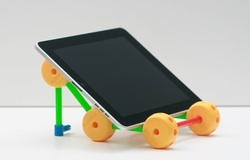 One teacher in our cohort has dealt with this barrier by bringing in her own devices for students to use. Others have been able to use their individual technology funds to purchase devices. I for one do not receive a technology fund and I am not wishing to bring in my own devices. If the ministry of education wishes students to have access to technology then they need to come forth with the money so our districts are able to fund this. Thanks for this thought provoking post Justin! This week I am the leader of a cohort led seminar on Gamification. This all came about as an assignment for my OLTD 509 course “ Emerging Technologies” . The first part of this assignment was to choose three emerging technology topics, ones we would be interested in researching, from a list outlined in the week 1 course plan. We also had to choose whether we wished to do this assignment independently or in a partnership or on a team with two others. We completed the form OLTD 509 Seminar Topic/Team Selection outlining our choices. Based on these submissions, our instructor, then assigned the seminar topics. I was assigned the topic on Gamification, my first choice, and I choose to do the assignment independently. Once assigned we then completed another form, also titled OLTD 509 Seminar Topic/Team Selection, choosing which cohort led emerging technology seminars we would like to participate in. Our instructor then had the daunting task of correlating who would present their seminars when, keeping in mind that each of us would be a participant in two seminars and present one, and all over a three week period, with varying size of groups. Our instructor shared that this was far more difficult than he ever thought it would be. A good lesson for those of us who may ever look to create, a seminar style assignment, in our own teaching. I then had the daunting task of putting together my seminar. It involved many hours of viewing videos, reading through online blogs and articles, and viewing a number of different game sites. It all came together and I presented my seminar plan. This brings us back to this week where I am hosting, independently, this seminar on Gamification. My seminar is hosted in the Gamification folder in our Google + OLTD Shared Space (Learning Community). Here you will find my seminar plan along with discussion posts on gamification. As a teacher and a student I am, of course, participating in my own seminar. I chose today to explore the different games I had posted, and from that list choose one or more to play. I soon came to realize I could answer one of the courses leading questions in relation to our critical challenge questions, “What are the barriers you might face in implementing a technology integration? As I teach Math 8 I decided to look at some of the Math related games, shared in my seminar plan. First I looked at Mystery Math Museum: “MMM is an iPad app for Game Based Learning. This app designed for kids 6-12, has them helping a ghost rescue dragonflies throughout 8 museums by solving basic math equations. “ First off this is an app that can only be accessed on an iPad or iPhone. I choose to download the app, it costs $2.99. I then waited for the app to load, and waited and waited. Then a sign popped up that said “Unable to Download App”. It gave me the option to retry which I did a number of times, but still no luck. I deleted the app and then went back and purchased the app again, not sure if I will be charged twice for it, still no luck. I soon realized that along with the barrier of the app not loading, that one can only implement this technology if one has access to the specific operating system required. Further, if ones school has iPads, one still must get permission to download that particular game app. Barriers every step of the way. While waiting for the above to load, I went and checked out The Lost Function: “An in-depth math game that has students interacting with a number of characters to solve Math equations to progress further in the game. This game takes place in a fully immersive 3D environment and has students solving a wide range of problems such as: decimals, fractions, and more.” I went directly to the site and checked out the student page, and intro video. Sounded like the game had a good hook for this age group. I then came across a great educator video on the parent page. It appears to offer all that I am looking for in online gaming for both myself and my students. Then came the barriers. First it is not a free gaming site, there is a fee for either individual accounts or class sets. I had hoped there may be the opportunity to try it free for a short period of time but no luck. So in order for me to make an informed decision there are a number of steps I will need to go through. Either purchase a single account using my own funds, or go through my administration to see if they will pay for a single use account, or see if we should contact the distributor so as to inquire what options are available. The cost related to each student account, could be a hindrance to even moving forth with this idea. Another barrier is that this game is hosted in the US. I may find that this point alone could stop the process from going any further. I have been told by a previous IT staff member that the district is not in favour of sites hosted in the US. This has been a true learning experience for me. An afternoon where my plan was to play games resulted in another outcome, me seeing the barriers one can come across in the process. I hope my next foray into game play will be more successful. In looking to your learning so far in this course, OLTD 509 Emerging Technologies, what is your answer to the following question: “What are the barriers you might face in implementing a technology integration? I have spent the last four days trying to use only my iPad Mini for this course. I have enjoyed the challenge. Friday night we began by using the Collaborate app to participate in a Collaborate seminar introduction. That night I was able to quickly and smoothly enter the classroom and participate. I had the opportunity tonight to participate in another Collaborate online session and it was not so easy. First I accessed the session link in Google + through the Google+ app, clicked on the link and it said my system did not support this. I then went and accessed it through Google + in Safari and was able to copy and paste the link straight into the space on the Collaborate app. I met with success. I found out after the session that there was video streamed that I and others on iPads could not view. Sad face. Spent the weekend posting and commenting in Google +. Started off accessing it through Safari. Then was told about the Google + app and downloaded it. Makes it so much easier to quickly view posts, write new posts and comment on posts. I am still however working on making my web links connect to my posts, hopefully third time lucky. I am also in the process of trying to figure out if you can copy a post from Google +. Have sent in a #tablet problem. This alerts the seminar leaders to an issue related to a task one can do on a PC but not a tablet. Learned the hard way that one should never write full post straight into Google + as it does not save it until it is shared and can easily,when using an iPad, be closed and lost. One of the biggest challenges was figuring out how to add information to our Google Checklist accessed on Google Drive. This checklist is used to track our participation in the areas of posts and comments in Google+, tweeting, and commenting on another's blog post. We were directed to download the app Puffin, a browser app that supports flash player. It worked, but it took sometime to figure out how to add information to each column and to insert a copy of the post/comment. I decided to download the Google Drive app and see if this would be easier to use. I will be sticking to accessing it on Puffin. Puffin is also a great app as it allows you to view videos on an iPad. Prior to downloading the app when on Facebook I could not view the linked videos, now with Puffin loaded I can. I have found that the number and variety of apps that are available both free and for purchase seem endless. Through exploration of educational apps I have seen just how important it is for a teacher to make an informed decision ascertained through time spent using the app and understanding all of its facets before sharing it as a classroom learning tool. Looking to the use of extras with the iPad. I purchased a keyboard. Sometimes it works great at others it suddenly will have a mind of its own and duplicate letters not just once or twice but at times rows of them. Needless to say this can get very frustrating. That is why I am presently typing using the iPads built in keyboard. It can be slower as it is designed for the two finger typer. One thing I find is that it thinks it knows best when to use a capital, needless to say I then have to go back and cor react the error. The one thing about an iPad is that once you have one, you wonder how you ever lived without it. Prior to this week I used it mainly for quick access for a Google search, access Facebook and to check email, where two accounts have been set to come to one site. I also took it on holiday as it is light weight and portable, left the laptop behind and did not want for it. It is amazing what tasks you can do on an iPad when you choose and commit to using it as your only computer. As with anything it takes time to learn and feel proficient with emerging technology. The key is being willing to take the time to learn it's many capabilities. It is then that you can make an informed decision as to whether or not the technology meets your needs and when looking to its use as a teacher both your needs and the needs of your students. The questions we need to ask ourselves as teachers are: Can this emerging technology enhance my students learning? Will it motivate them? ***My blog post for this week. Written, copied and posted in Weebly on my iPad Mini. I used word doc found in the Smart Office 2 App to write the post. From there I emailed it to my gmail account. Accessed the email through the mail icon. Opened the document copied the post. Accessed Weebly through my web browser Safari. Signed in and accessed new post on my 509 blog page. Pasted the post. Clicked to add an image. Chose web search, entered the word iPad. It took me to images of iPads both professional and free. Went to free, acknowledged in writing that they were Creative Commons. Uploaded picture to my photos. Then uploaded it to the image spot in the post. Tapped on publish. Then exited editor and Weebly. I then went to Safari and viewed the post that you see above. More spacing then I had hoped, but besides that a successful endeavour. Thanks Jean, Sonny and Breanne for setting this challenge! Once again Avi has caught me in his web, but unlike a fly I am not fighting to get out. I have instead gladly immersed myself in the “web”, directing my energy to the pursuit of knowledge, knowledge of emerging technologies. One need only do a Google search, or go on to Twitter or YouTube or explore the different Google + Communities to gain this knowledge. 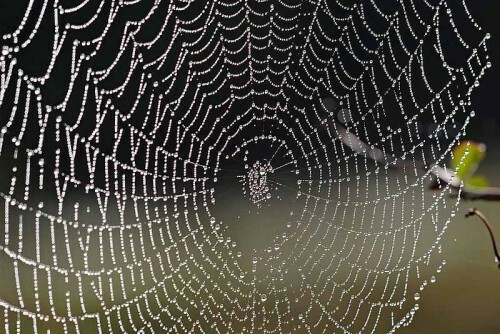 One can get so caught up in the “web” in the acquisition of knowledge, that when they resurface they think time has stood still, but really it was that they were lost in the “flow”. Evidence of this is found in the comments posted on my Google + post that shared the Gamification in Education Google + Community. Jay L stated, “I made the mistake of checking out this link and surfaced an hour later!” Avi shared, ”I come in to hang out for 20 - 30 minutes and get into the flow of people's ideas... and two hours later I "wake up" to discover my tea has gone frigid.﻿” Last week I had a similar experience, as I immersed myself in the study of emerging technology while on a mobile device. To find out about this experience read my blog post “Emerging Technology”. With the myriad of information out there how does one go about making the right choices? This week in preparation for my seminar on Gamification I spent hours… online viewing videos and images, reading articles, blog posts, infographics, going in to Twitter to scroll through related hashtags and exploring different sites that host online games. It was all consuming. But I was able to narrow my topic and then focus on what I felt was important. During my many hours of exploration I came to wonder, if it is taking me this long to plan one week, how long must it take each of our instructors to plan a course. This made me come to the realization of just how much I am looking forward to the time when I can direct my enthusiasm and energy, whole heartedly, to the application of my learning to my own teaching and course development. As we move forward in this course I look forward to being caught in a web as I participate in the seminars on tablet computing and eBooks/eTextbooks. Scenario: You have just dropped your car off to have the windshield repaired and have been told it will take at least 25 minutes. A suggestion of a coffee at the local restaurant has been given. As you make your way there you wonder how you are going to spend the 25 minutes. Seated, coffee in hand you retrieve from your coat pocket your new to you iPhone4. You sign in and see that it is already connected to Shaw Open. In an instance you are checking your emails. The most recent is a group email from your OLTD 509 instructor, an update on the previous nights online Collaborate session outlining that there is new material in the course, a web link is provided You click on the link and you are taken to the course home page hosted in the LMS Canvas, viewed without even logging in to the course. You click on a link, which is for an external URL, and are taken to a paper on “Mental Models”. You proceed to read this on your iPhone. Article read, you go to the OLTD 509 Google + Community site to see if there are any new posts or response to one of your posts. A note pops up asking if you wish to get the free “app” for Google+. You accept and click to install, which takes just a minute or two. You now easily access Google+ by clicking on the app icon on your iPhone and then sign in with your user name and password. While looking in Google + you see your post from last night that includes a link to a tweeters Scoop-it site. You click on the link and are taken to the Scoop-it site where you discover other articles that relate directly to emerging technologies and want to share with others in your cohort. You leave this page with the click of a button and then click on your web browser app, Safari, and do a Google search for Twitter. It brings up a number of website options. You click on the main website link. Surprise it asks you if you want to download the free Twitter app, but off course. Done in the blink of an eye, you then click on the button again and are back at your iPhone springboard page, this is where all your apps are. You click on the Google + app and then on the Scoop-it link in your post and you are back to the Scoop-it site. You find again the article in Scoop-it you wish to share, click on the tweet button and a post is shared on your twitter page. In a short time you figure out how to post and retweet to the course hashtag #oltd509. You then decide to look to see if 25 minutes has passed and realize that you have been in “flow”, as over an hour has passed. You push the button to leave the site you are on; click the button at the top of your iPhone and the screen goes dark. As you get up you say wow mobile devices, in this situation iPhone 4, can be amazing. You realize that if this had been but a month ago you would have sat with your coffee either reading a paper or people watching as the Android phone you had did not have the features that you have just discovered on your iPhone. Thinking this would be a great topic for your week seminar you start outlining your ideas as you are driving home. One thought, where were we all in our use of mobile technology two years ago? Me, it involved using an Android phone to text and call people. Was this true for others in our cohort, I wondered. I thought a Doodle checklist, Google survey or Padlet could be used in a course to answer this question in an interactive way. I could use Weebly as my course base and include YouTube videos. Started thinking about how some people in our cohort had just started using iPads when we began OLTD and now many more are joining in our collaborate sessions via iPad or on a mobile device. Boy the change we have seen in just a year and a half. Arrive home, hyped about learning more about “Mobile Learning”. I get my iPad and access our course in the LMS Canvas so I can complete and submit the topic selection form, created in Google Drive. No mobile learning on the list, what? Look back in the course and see it is crossed off as we will cover this in our next course, sad face. Back to my iPad and proceed to look at the other seminar topics and before you know it I am on to being inspired by a new topic. All this began because I needed to have a chip in my windshield repaired. This scenario and how it revolves back on itself, all be it with me accessing my iPad at the end instead of my iPhone, made me think about the book "If you Give a Mouse a Cookie". I believe in the past when encountering emerging technology I would have been very much like the mouse asking for help each step of the way. Thanks to OLTD I have come a long way. I now have a confidence I would never have known possible. For this I say a big thank you to both our OLTD instructors and the amazing cohort that I am a part of.